When: Sketched out quickly in November 2013, but the rest was done completely on December 28, 2013. Purpose: Commissioned by Edy Steggs as a birthday gift for her husband, Dave. History: I remember when I first met Edy at church; a series of 11 of my drawings were in the process of being displayed around the sanctuary, and I remember that she really really liked them. 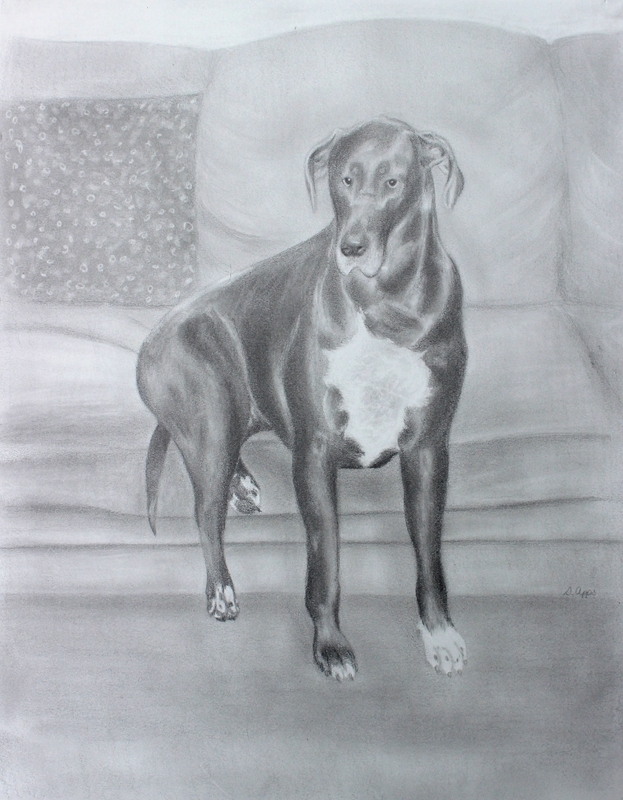 She approached me last year about doing a drawing of their great dane, Q.D., as a gift for Dave’s birthday. Q.D. apparently sits on the edge of the couch, and she wanted to capture that as a special surprise for Dave. Thought process: This was pretty straight forward; Edy sent me a few pictures of Q.D. sitting on the couch, and narrowing it down was pretty tricky. Trying to figure out how much of the couch to include took some time; I wanted enough in the picture so you knew what the dog was doing, but yet not so much that it took away from the dog. Once I figured out which picture, it went pretty well. Figuring out what to do with the pillow was tricky. The pillow in the original picture has a floral print on it. I didn’t want to do the exact pattern as I was afraid it would be too busy and would take away from Q.D.. What I basically ended up doing was making a gray pillow and then using two different erasers in two different patterns to create a design on it. It was soft enough to not take away from the dog, but still interesting enough to create a nice composition. I thought doing Q.D.’s chest patch was going to be difficult with the black skin markings with the white fur on top, but it ended up being ridiculously easy! Favorite part of the piece: I think, hands down, my favorite part of commissioned pieces is seeing the joy on people’s faces when they unwrap the drawing for the first time. Edy was thrilled, and the Sunday after Dave’s birthday, they both came over to thank me for the drawing. I love being able to make people happy! 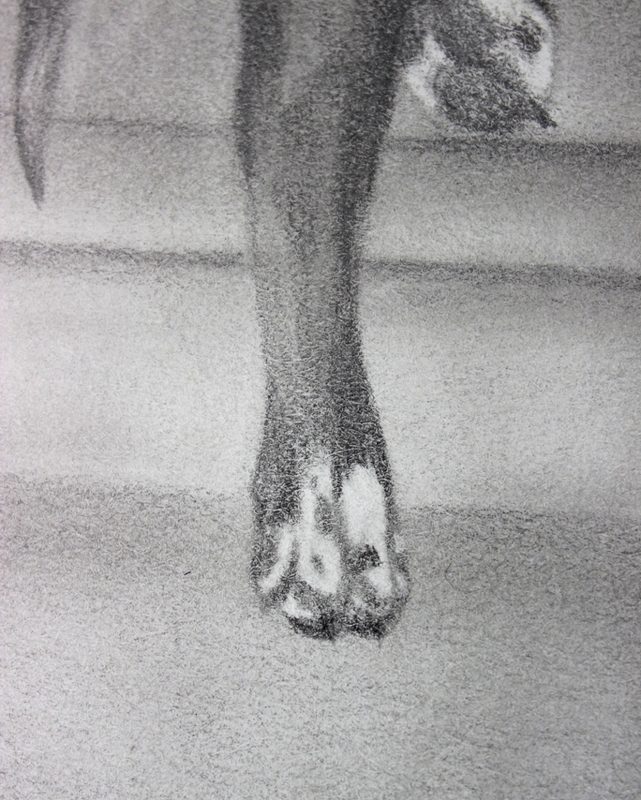 Oh, and is it weird that I love Q.D.’s paws? I love the spots on them! Isn’t it cute? Fun tidbits: Between Q.D. 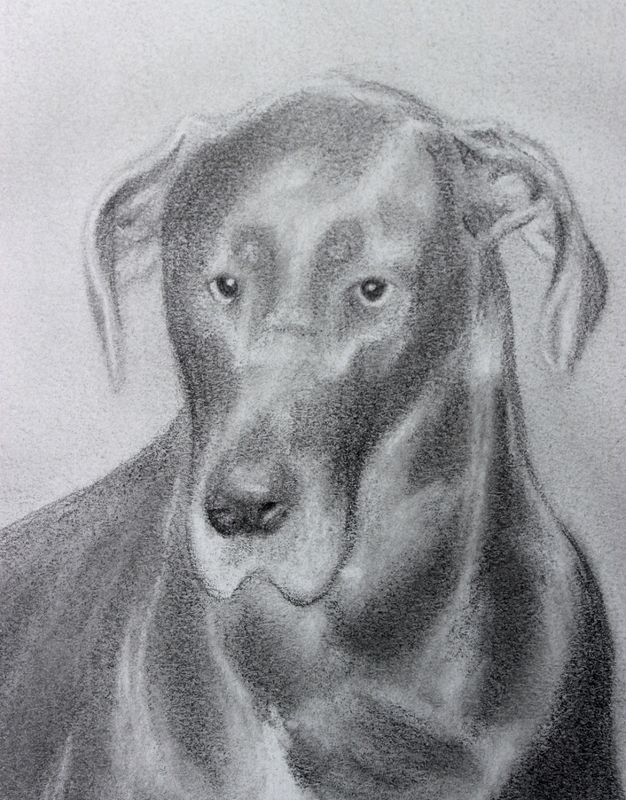 and Milo, I’m discovering that I love to draw animals! I’m debating what animal to try next: a long haired dog, a curly haired dog, or a cat. Also, this post wasn’t supposed to go up for another couple weeks. But, I just happened to look at the church calendar and discovered that today is Dave and Edy’s wedding anniversary! It felt appropriate to rearrange my posts so this could go up for them today. Happy anniversary, you two! What animal should I try to draw next? History: The teacher we had for this class was very much into incorporating random things together and abstracting everything. Our assignment was to do a self portrait, but we had to put something into it that made the viewer think about what was really happening. Thought process: I was going through a really difficult time when I did this drawing. I had post-traumatic stress disorder and was in therapy. A previous relationship from high school was coming back to haunt me, and I used my art as a way to work through it. 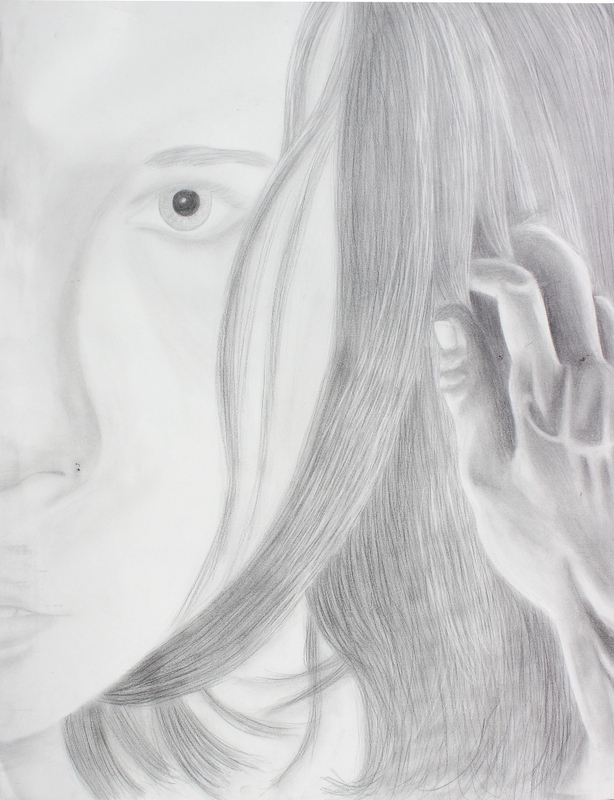 In order to get the hand in the hair to look right, I took a picture of myself with my own hand raking through my hair. I made it more muscular like a man’s hand, thinking along the lines that my personal demons are causing pain or remembering physical abuse that I had been on the receiving end of years before. I wanted to keep the details light except for the eye; I wanted to convey my thoughts of wondering if anyone was really seeing what I was going through. Problems I encountered: Getting the hair and hand to work together was a big struggle. I don’t think it’s quite right, but it took a long time to get it to where it is now. Fun tidbits: I think the model I used for all the detail in the hand is actually from Michelangelo’s sculpture David! Favorite part of the piece: I think the eye turned out really really well! What do you use as an outlet when you’re going through a difficult situation? When: Sometime during my college years; I think this was spring semester of my senior year, 2006. Favorite part of the piece: I think I did pretty good on the hair for once! Yay! Least favorite part of the piece: The mismatched eyes. Ugh. 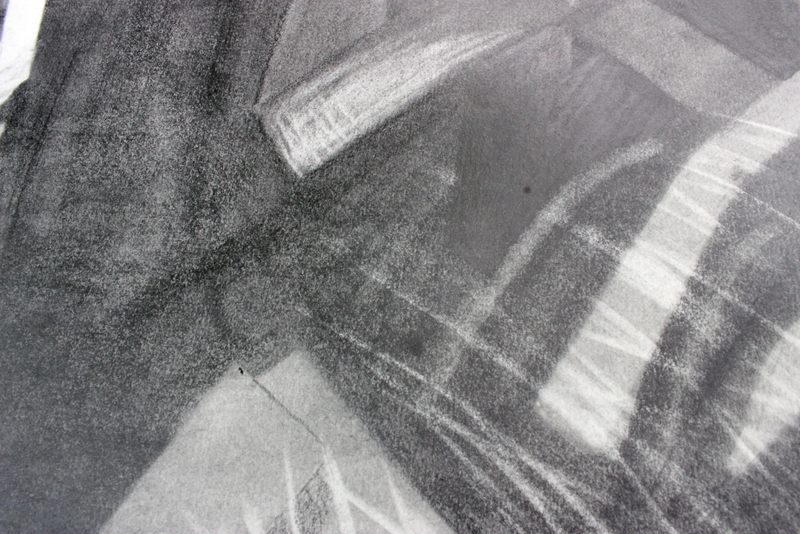 And the fact that the drawing, even though it was in a portfolio, is damaged on the right side. Have you ever had to do a self portrait? How did it turn out? And this week’s Throwback Thursday piece is…..
History: In my class, we were learning about positive and negative space, as well as making interesting compositions. One of our homework assignments was to draw 10 random interesting objects. I think I had chosen things like my scissors, a pile of hangers, a hand, my light…things like that. I remember feeling frustrated after putting time into sketching in details of all the objects to just go in and fill them in with permanent markers. For this assignment, we had to take those drawings and do a large three panel drawing. One panel had to have one image repeated, another had to have four images collaged together into one large image, and the last panel had to have one image but it had to divide in half so one part would have the image positive space, the other half would have the image as negative space. Thought process: This was one of our first assignments for that class, so I didn’t really know what I was doing. Our professor wanted to three panels to flow together, and I remember it being hard to get the flow. My middle panel took awhile to get it to mesh well with the left panel. Most of my classmates divided their last panel either horizontally or vertically, but I did mine at a diagonal as I thought it mimicked the angle of the scissor handles coming down as well as created more flow for the white traveling into the last panel. Problems I encountered: Have you ever tried doing a huge project in winter in a small room with just permanent markers? Hellooooo fumes! And headaches. And dying markers. I think I went through four or five of the big fat permanent markers for this project. Fun tidbits: How did this piece get it’s name? It was totally unintentional, but when the piece was done, it looked like this really silly looking rabbits were falling to their death in the left panel. In the middle panel, it looks like a priest hand blessing them as they are heading towards the light in the right panel. Random, I know, but the title stuck and it’s one of my favorite pieces because of that! Favorite part: I love the flow of the piece, how it draws your eye to the right. I also like how the middle panel turned out. Least favorite part: I don’t like how streaky the marker is. I’m such a perfectionist! Here’s this week’s Throwback Thursday piece! Time to complete: Actual drawing time was 2 weeks; there was a lot of planning and waiting before I could start drawing. History: This was commissioned by some friends of ours after they won my certificate in our church’s 2013 short term missions auction (see the 2014 piece here!). They were so excited they won, and instead of having me do a drawing for them, they wanted me to draw a mutual friend’s new house that was in the process of being built. This house process had been a huge, stressful ordeal for the friend’s family, and they wanted to do something really special for them as a housewarming gift. Thought process: This piece was pretty straight forward. We knew we wanted the front of the house, make it sunny with a few happy clouds, and remove the neighboring houses from view in the picture. Problems I encountered: This piece took a long time to get a concept for. We had to wait for the house to be built, get windows and doors installed, siding put on, roof completed…I worked on the drawing bit by bit, and thankfully my husband works a few minutes away from the house; I sent him over to the house multiple times to get pictures of progress so I could keep working! Getting the different shades of gray were hard. When I took the digital photos and edited them into gray scale, the sky and siding colors blended in. I had to push the sky a little darker and the siding a little lighter than it should be in order for it to be defined enough. The windows were a pain as well. All those little lines on the windows were so hard to keep straight and equal width! I’m so thankful for my eraser pencil; I think that’s the only thing that kept me sane while finishing the windows up. Favorite part: Handing it over to our friends during their housewarming party was the highlight! Seeing their excitement and then having them hang it up right then was just an amazing feeling. They worked so hard to get this house done, and had so many bumps in the road during this journey that having something to commemorate the experience was just awesome. Lease favorite part: I don’t know if I have a least favorite part. That’s a nice change of pace! 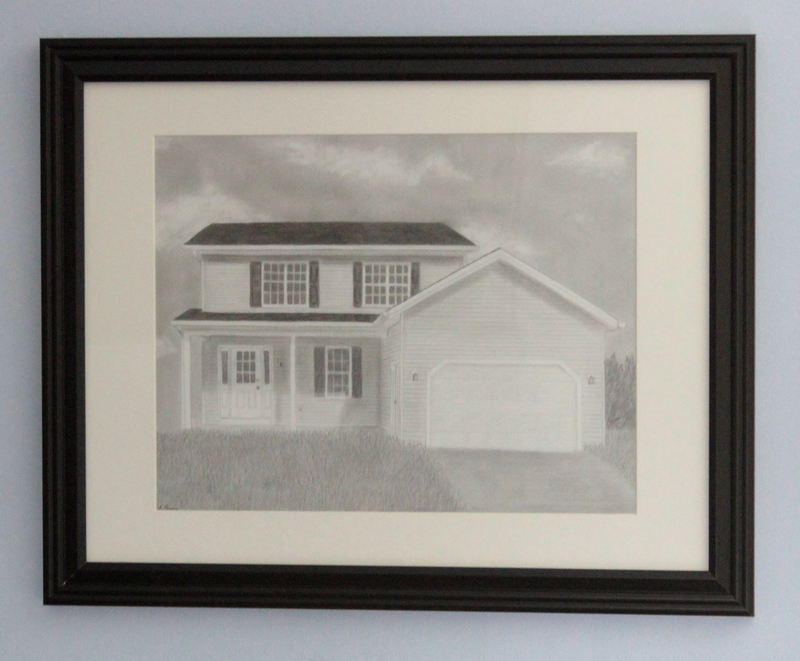 Have you ever had a special photograph or drawing done of your house? 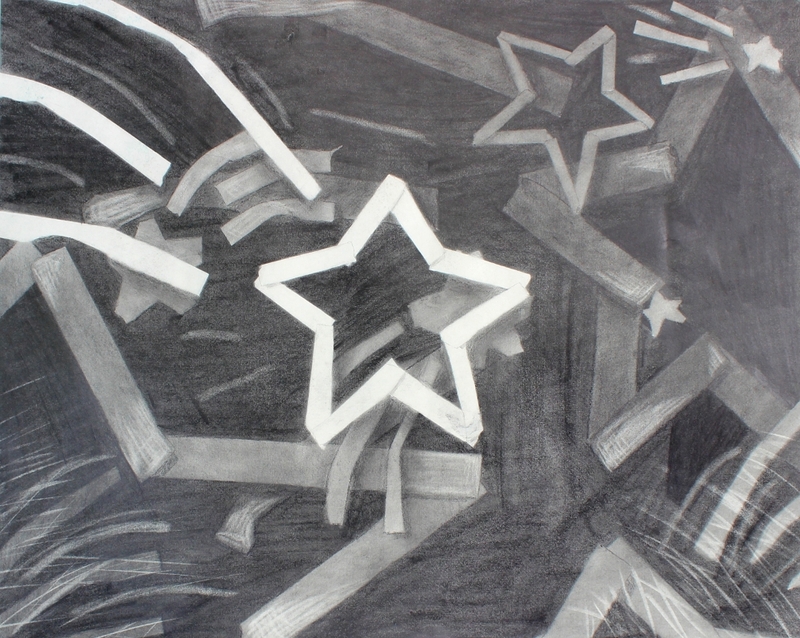 Title: I think officially it’s Untitled, but I always call it Stars. When: Spring semester, freshman year of college; 2003. Purpose: Assignment for my college intro to art class. History: At this point in the semester, we were working on shading and how it caused things to go into the foreground or background. My professor had us do these masking tape drawings to help us learn out to shade better. Thought process: Oh man, this project was stressful. In order to successfully complete the project, you had to think backwards. Whatever you wanted in the foreground got put on the paper first, and then each layer farther back got put on top of that. Basically you figure out your design (I knew I wanted to do shooting stars) and then using your masking tape, tape your design down layer by layer. 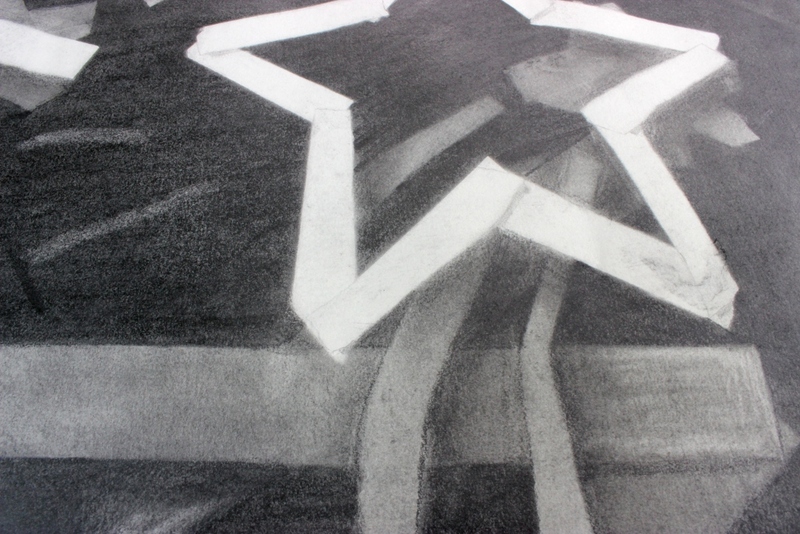 Once all of your design is taped down, you cover everything (paper and tape) with a dark dark dark layer of graphite. After it’s covered, remove the first layer of tape (which will be the second layer from the background) and color that in a little lighter than the background. 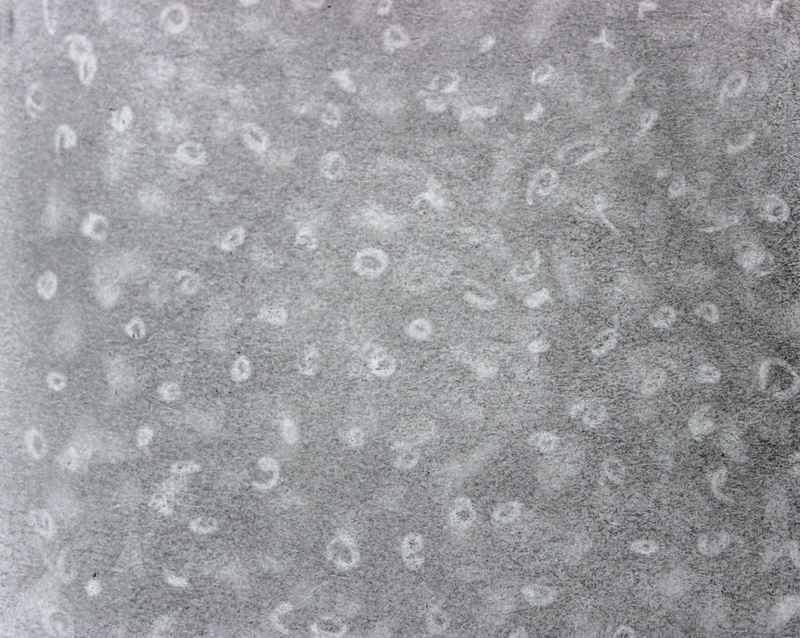 Once that layer is done, remove the next layer of tape and repeat. The last bit of tape you pull off should be the whitest, causing it to pop into the foreground. Once you’ve got your main shading done, then you get to figure out where your light source is coming from, then add shadows cast from the fore ground images on the background images. It’s complex and frustrating, but at the same time it looks amazing when it’s all done! Problems I encountered: Getting each layer to look a different value of gray is hard! Figuring out which layer is going to go where all while thinking backwards is not my strong suit, so my brain got cramped a lot while doing this. 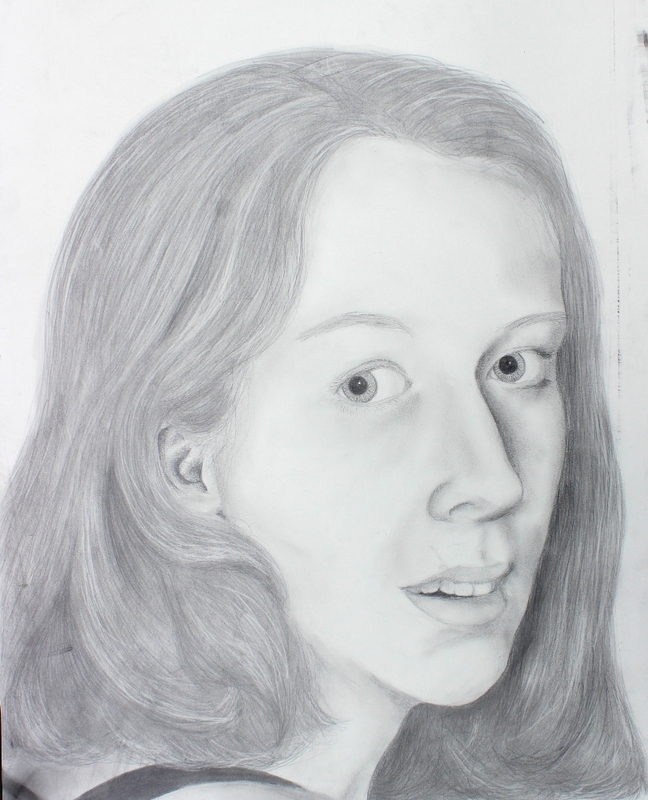 Fun tidbits: This piece was entered into the student art show that year! YAY! It didn’t get a prize, but still getting it entered and being able to show my family that I was in an art show was pretty awesome. The reason I’m jealous of this drawing is that it has been to Jamaica and I have not. 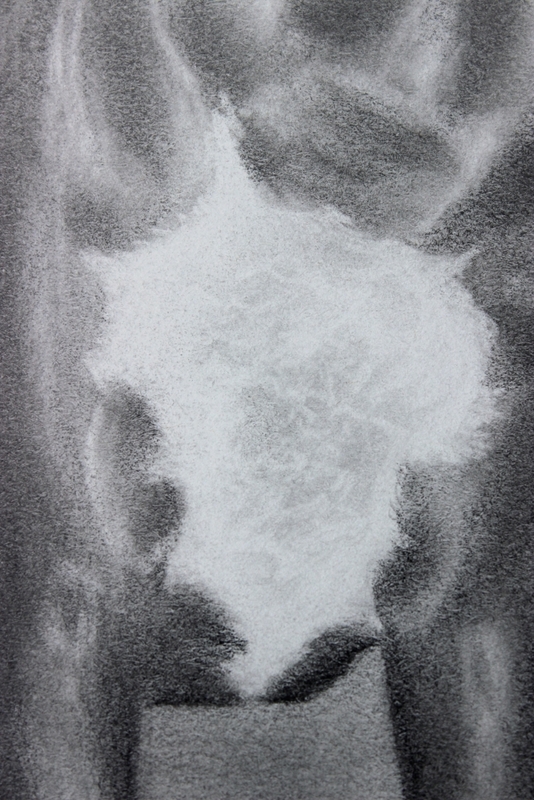 The following school year (my sophomore year) our college did a student art work share/show with a school in Jamaica, and this piece was chosen to go be on display. My professors wouldn’t let me go along for the ride, unfortunately. I’d love to know what the school looked like, how warm it was, and just anything about Jamaica, but my drawing isn’t telling me it’s stories. It’s a stubborn drawing. Have you ever been jealous of an inanimate object, or am I all alone in this?